Wirefly (http://www.wirefly.com), an online leader in one-stop comparison shopping for cell phones and wireless service plans, today released its list of top-selling music phones. The trend in entertainment-on-the-go shown to be fueling widespread music cell phone adoption. 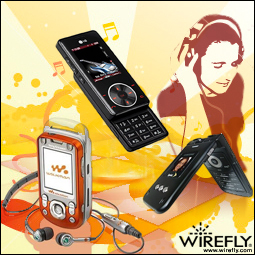 Wirefly (http://www.wirefly.com), an online leader in one-stop comparison shopping for cell phones and wireless service plans, today released its list of top-selling music phones. "Music phones are cell phones that allow users to import MP3 music files or iTunes from their PCs or download them wirelessly from a content provider. These types of cell phones are our fastest-growing category of wireless handsets," said Brian Westrick, President of Wirefly. "Music phones only joined the cell phone lineup last year. Still, according to a recent IDC study, over 50 million U.S. consumers will be using over-the-air wireless music services by 2010. We see music as an enormously popular feature in the wireless market today." As the back-to-school season begins, cell phone manufacturers are introducing new models with more advanced music features to rival most portable music players. The new LG Chocolate, which will be released by Verizon Wireless this month for example, is generating a lot of buzz. The LG Chocolate features an iPod-like click wheel and a memory card that can hold up to 1,000 songs. The Motorola SLVR L7 delivers both form and function; The SLVR L7, which also supports iTunes, is a thin candy bar cell phone and comes in hot pink or black. The new Verizon RAZR v3m takes America’s favorite cell phone and adds a music player. Other phones which grew quickly in popularity among the music-loving crowd were Samsung's A920 for Sprint and the A950 with V-CAST for Verizon Wireless. Both feature external music controls and expandable memory card slots to hold music files. Technological improvements and an increasing appetite for portable music have fueled interest not only in all-in-one cell phones, but also in robust content services. Some of the newest music phone models take entertainment to the next level. Music phone models like Sprint's LG Fusic LX550 and the Virgin Mobile Sonic, are truly designed to replace stand-alone music players. These multimedia phones offer advanced content services like live streaming downloads, satellite radio and FM broadcasting, and superior sound quality. In the recently published 'U.S. Wireless Music 2006-2010 Forecast and Analysis,' IDC also reports that "Mobile music storefronts are emerging as one of the most important new channels for fans to discover, purchase, and enjoy full-track music and related content" Music cell phones will soon surpass stand-alone mp3 players in terms of popularity. Wirefly also provides mobile content and ringtones downloads via its site Mfly.com. Launched in 2003, Wirefly (http://www.wirefly.com) is an online leader in one-stop comparison shopping for cell phones, wireless service plans and wireless accessories. A wholly-owned subsidiary of InPhonic, Inc. (NASDAQ: INPC), Wirefly is an authorized dealer for every major cellular carrier, including Cingular Wireless, Verizon Wireless, T-Mobile and Sprint. Wirefly also offers discounts and services not available in retail wireless stores, including real-time online order status and tracking, and the guaranteed lowest price – online or anywhere else -- on cell phone devices from Motorola, Nokia, Samsung, LG, BlackBerry and many other cell phone handset manufacturers. Wirefly.com has been named Best of the Web by Forbes magazine as the "best all-around number portability portal" and "Best in Overall Customer Experience" by Keynote Performance Systems. For more information on Wirefly, its wireless products and its services, visit http://www.wirefly.com. Wirefly Names Best-Selling Music PhonesWirefly's best-selling music phones point at a growing trend to combine cell phones and music players. Wirefly.com LogoWirefly is the leading online source for researching and buying cell phones and cell phone plans.